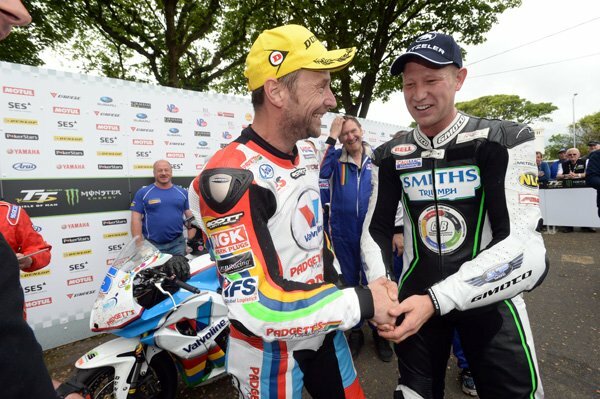 Gary Johnson took his second TT race win after coming home just 1.5s clear of Bruce Anstey in a thrilling opening Monster Energy Supersport race. Riding the Smiths Triumph, Johnson grabbed the lead on the opening lap. However, the gap to Anstey constantly fluctuated and although the difference was just 0.011s at Cronk ny Mona on the final lap, the Lincolnshire rider grabbed the win to give the British manufacturer their first win since Anstey’s in the same race in 2003. The race was delayed by three hours due to overnight rain and fog before it finally got underway at 2.05pm and the theme for the race was set at Glen Helen on the opening lap as only 0.009s separated Johnson and Anstey with Dunlop only a further half second back. Dean Harrison was holding onto a good fourth, a position he held jointly with Guy Martin whilst Conor Cummins slotted into sixth. By Glen Helen second time around, Anstey was ahead for the first time, albeit by only 0.8s, but it was short lived as Johnson again held the lead by Ramsey his lead now 0.7s. 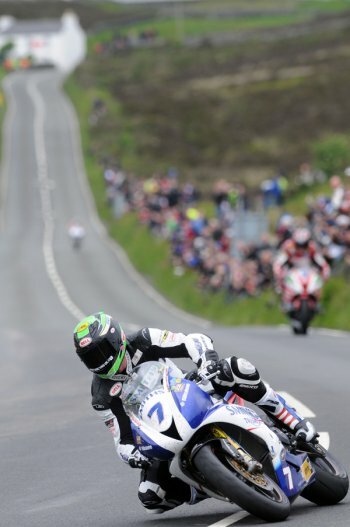 Dunlop had also closed in and only 1.5s separated the three riders as they headed up over the Mountain. Johnson and the Triumph were up and down quickest and he came into the pits with the fastest lap of the race – 126.732mph - and a lead of 2.4s as Dunlop also fell back, 3.7s behind Anstey. As has happened in so many races though, the Valvoline Racing/Padgetts Honda crew turned their man round the quickest and the gap at Glen Helen on the third lap was back down to just a third of a second. The lead had extended to 3.8s by Ramsey, Johnson again having a great run from Glen Helen, but with a bit of rain falling over the Mountain, Anstey had brought the gap down to 2.8s down as the riders headed out onto their final lap. Johnson again proved the quickest to Glen Helen, almost doubling his lead, but Anstey was on a charge and the gap continued to fall throughout the lap. 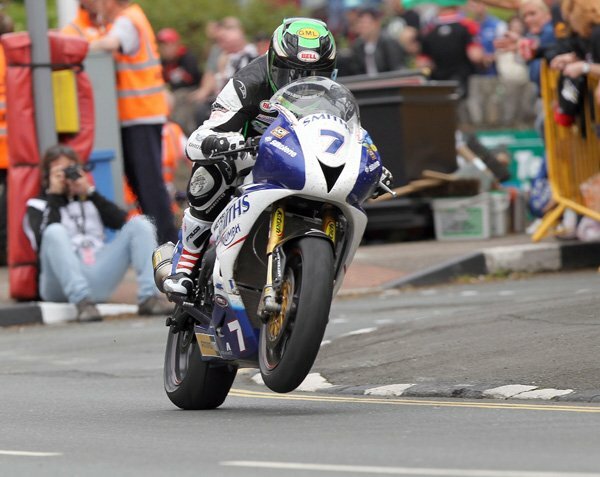 Down to 2.3s at Ramsey Hairpin, the two could barely be separated at the Bungalow or Cronk ny Mona but Johnson wasn’t to be denied and he came home for his second TT win, three years after he won the second Supersport race in 2011. Dunlop was secure in third but the battle for fourth was in doubt for much of the final lap but when Cummins went out at Ginger Hall, it allowed Harrison to take the position. Team-mates William Dunlop and Guy Martin filled fifth and sixth with James Hillier, Lee Johnston, Michael Rutter and Keith Amor completing the top ten. As the lap progressed, Johnson held the lead by the smallest of margins and with an opening lap of 125.766mph, he was 1.6s clear of Anstey as they headed out onto lap two. Dunlop was still in third but had slipped to three seconds behind with Harrison, Cummins and Martin still filling the top six positions.